Katumba, the largest drum and movement ensemble in the North West, is launching the Katumba Cultural Hub on Saturday 24th of November, in an event with performances, workshops and raffles for all to take part. Officiated by Cllr Anna Rothery, Princes Park Ward, the event is open to the community, with FREE activities for the whole family to get a taste of what is to come. 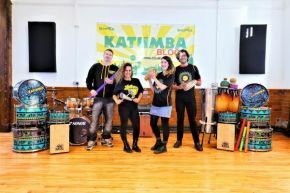 Since 2015, Katumba has inspired people all over the world and performed to a variety of audiences including Brazil, across Europe, and for brands such as Google and World Rugby to name a few, as well as delivering workshops with a strong Health&Wellbeing focus (i.e The Stroke Foundation) Team Building (BrightHouse) and education in several schools across the North West. Katumba’s vision is to create a diverse and inclusive cultural hub in the heart of Toxteth, reflecting and supporting the diversity that community is known for: combining all their activities under one roof, the Katumba Cultural Hub will offer weekly community drumming rehearsals, movement and percussion classes, as well as expanding its offer to include dance, yoga, a rehearsal &recording space for musicians and other art forms; regular open events and a year round programme with guest artists, collaborators, and much more! ‘For over 10 years we have dreamed of having our own space, where we can combine our unique form of drumming & movement with other arts and community building activities. To finally be here is very exciting! Toxteth has always been my favourite area of Liverpool, and to be situated right in its heart, near to our home is a great opportunity for both KATUMBA and the people that live around us.A massive thanks has to go out to Lee Curry and the board of Toxteth T.V for supporting us and letting us create this space. We’re now looking forward to 2019 and the amazing things we can do.’ Says Ritchie Tunstall, Artistic & Musical Director. A self- funded initiative, launched on a shoe string under Katumba’s umbrella Not For Profit social enterprise BrazUKa International, the refurbishment of their space, housed within the 150 year old building John Archer Hall-which is part of the Toxteth TV initiative-was largely executed by the community and would not have been possible without their effort and support including that of Toxteth TV; taking approximately 2 months, goes to show how much can be achieved when people come together for a common goal. ‘Toxteth TV are absolutely thrilled that Katumba have decided to stay with us, moving into one of our larger suites so that they can grow and expand their activitie including working more with the local community and partnering with other creative organisations that we house. Juliana, Ritchie and their team are a great bunch of people and haves supported Toxteth TV for many years so it’s great to be able to return the favour’ says Lee Currie from Toxteth TV. On the 24th of November, Katumba invites the local and wider community to help them celebrate and take part in all the activities offered as a taster of what’s to come; doors open at 2pm with workshops for adults and children; at 3pm Cllr Anna Rothery, Princes Park Ward, Liverpool (Labour) will officially open the space, followed by a performance by Katumba Show Band, and more workshops to follow on African Drumming and Dancing delivered by Djembe Liverpool and Movema, Poi and circus skills by Bring the Fire Project and more! What: Grand Opening of Katumba Cultural Hub: drumming & dance workshops, raffle prizes and more!